Wooden box in white with sliding lid and internal division of 4 cm. This reference is the same as our box Ref.P1454D but now also in white;) Perfect for photos of 13x18 - 15x20.Measurements - Outside of the box 28x19x6 cm. - Interior space photos 21.5x17x4.5 cm. + Hollow 4 cm. - Useful part of the lid for engraving 25x17 cm..
Square white wooden box with smooth wooden sliding top, with interior hollow for photos of size 10x15 + hollow PenDrive..Measurements - Exterior of the box 17,5x17,5x5,5 cm. - Interior space photos 16x10,5x4 cm + hollow 4cm. - Useful part of the lid for engraving 16x16 cm..* The filler chip is sold separately Filler chip. 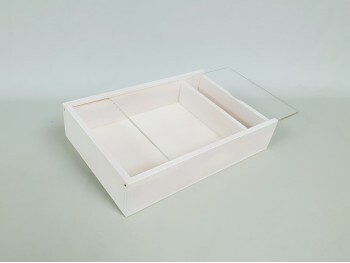 Square pine wood box with sliding cover in colorless methacrylate, ideal for displaying photos without opening the box. The interior of the box consists of 2 compartments for photos and PenDrive..Measurements - Outside of the box 17,5x17,5x5,5 cm. - Interior space photos 16x10,5x4 cm. + Hollow 4 cm. - Useful part of the lid for engraving 16x16 cm. . Aged squa pine box with a Methacrylate sliding lid, with an internal partition for 10x15 size photos + PenDrive hollow. .Measurements - Outside of the box 17,5x17,5x5,5 cm. - Interior space photos 16x10,5x4 cm. + Hollow 4 cm. - Useful part of the lid for engraving 16x16 cm. . * The filler chip is sold separately Filled Chip. Poplar wood box with sliding lid and frame on the lid. These boxes are perfect for photos of size 13x18 - 10x15.Measurements - Case exterior 28.5x14.5x3.5 cm. - Interior space photos 18,5x13,5x24 cm. + 2 holes of 8x6 cm. for PenDrive and card - Useful part of the cover for engraving 27.5x13.5 cm. Natural wood box for photo Album. It is perfect to deliver your photo album in a beautiful and practical wooden box with sliding lid. Available in 6 measures..If you want to add an engraving click on the "Add engraving to this product" button and follow the instructions. . Wooden box in White with wooden sliding lid. Ideal for the delivery of the photo album. Elegance and total protection. Available in 3 sizes suitable for various sizes of Album.If you want to add an engraving click the "Add engraving to this product" button and follow the instructions. . Aged wooden case for album with wooden sliding cover. Designed to make your deliveries even more elegant . Measure - Inside the box 37x31x6 cm. . If you want to add a recording click the button "Add recorded to this product" and follow the instructions. Aged wooden case for photo album with methacrylate sliding lid available in various sizes. With this cover you can present your work in a more elegant way. Aged interior and exterior to give a more 'rustic' look to your work. Available in 4 sizes . If you want to add a recording click the button "Add recorded to this product" and follow the instructions.